This scuba diving trip in Bali is perfect for certified divers looking to explore the exotic marine life of the Bali sea near Amed. This one day trip offers two open water dives that will take you down upto 40-100 feet/12-30 meters depending on your prior level of certification. Dive into the clear blue water of the Bali sea and discover exciting new dive sites, from the Japanese shipwreck to the Amed Wall. Encrusted with corals and home to diverse species of marine life, these pristine dive sites offer a stunning visual experience. Please note that only divers certified as SSI/PADI Scuba Diver or higher are allowed to book this course. Amed, one of the seven villages on the eastern shore of Bali, is popular amongst scuba divers that come to explore the Japanese shipwreck on the Bali sea floor near Amed. The dive site features a deep drop off in the sea floor, where you will pass in between unique rock formations of vertical walls and pyramids. Other dive sites include the Amed Reef, a fun spot for drift diving where you'll see white-tip reef sharks, and the Ghost Bay, open for muck divers who can spot lots of small critters and reef fish here. 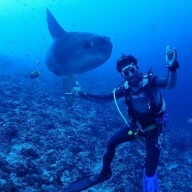 • Complete two open water dives in the turquoise Bali sea. 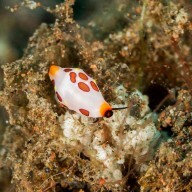 • Enjoy diving in excellent visibility conditons to spot exotic marine life. • Spot triggerfish, groupers, scorpionfish, moray eels, reef sharks and more. • Spend the day on the Bali sea with gorgeous views of the island. You will have to sign an indemnity form before beginning the scuba diving trip in Bali. Divers are required to carry their PADI/SSI card to authenticate their scuba diving certification level. Go scuba diving in Amed, Bali! Your pick-up will arrive to take you to the dive centre in the morning. You'll be heading on a short drive to the dive centre in Sanur, where you'll have a briefing session with your dive instructor. You'll then continue your journey to Amed on a boat. Over the course of the day, you will complete 2 dives, going as deep as allowed by your prior level of certification at two different dive sites in Amed. An appetizing lunch with snacks will be served in between your dives. You'll head back to your dive centre in Sanur by late afternoon. Your trip ends here. A pick-up and drop-off is offered between the hotel and your dive centre. Please inform the tour operator the exact address of your hotel or place of accommodation before your trip. A lunch will be served between the two dives.